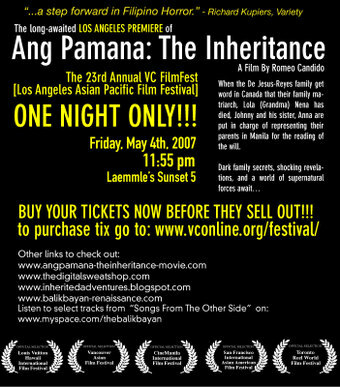 Breaking news: Ang Pamana: The Inheritance will be screening in Los Angeles as part of this year's VC Fest! Screening dates have not yet been set. Our first screening on Saturday March 17th is already SOLD OUT! Click here to buy Tuesday tickets - FAST! Last year I co-wrote a film called Ang Pamana: The Inheritance. It's been touring film festivals, and it's finally coming to San Francisco as part of the San Francisco Asian American Film Festival. There will only be 2 screenings of our film during the festival. ONLY 2. And I don't know when you'll be able to see it next, or ever again, unless we get picked up by some art-house distribution. These 2 screenings are the ONLY 2 opportunities that I may have to gather my friends so you can all validate my ego by cheering, whooping and hollering LOUDLY when my name flashes across the screen during the opening credits. I don't need much ego validation these days, but it's not every day I get to see my name on a movie screen. I'll be in San Francisco and attending both screenings. If you don't see my name on the online program, don't worry, it's on the printed program, which is available all over the City. Creative Team: The Digital Sweatshop, Inc. In the immortal words of the Spice Girls - Say you'll be there!